A special thanks to Dori and Kelin from Framing the Cause Pictures for this fantastic short clip on what NY+20 was all about! As part of the MyCity+20 global youth initiative, a diverse group of youth came together in New York City on April 27th, 2012 to assert our common commitment to a healthy and sustainable world. NY+20 inspired youth to become involved in the UN processes that impact their futures. At the end of the meeting we established a “Youth Statement” with four critical areas for action ahead of the UN Conference on Sustainable Development (also known as Rio+20) and call for world leaders to implement the following commitments. We will be presenting our “Youth Statement” at a side-event for at the UN Headquarters on April 30 from 6:15 – 7:45 PM during the UNCSD second informal-informal negotiations on the Zero Draft of Outcome Document of UNCSD. We have twenty-five passes for the side-event. If you are interested in attending the side-event, please enter your information here (or application found below- click submit) before 1 PM on April 30, 2012. We will give the twenty-five (25) passes to the first 25 people who apply. We will be emailing the first 25 participants by 1 PM on April 30,2012. Registration for the side-event is at the UN Visitors Entrance is located at 46th Street and First Avenue. Please make sure that you can be at the UN Headquarters before 3 PM to register. It is very important to bring a government issued ID. NY+20 Draft Youth Statement HERE. We would like to say a massive THANK YOU to everyone who participated in NY+20 on Friday!! The team was blown away by the incredible contributions of all the attendees and speakers. This is an incredible accomplishment for youth, and we look forward to building on this success as we move forward with the UN Side Event on Monday and eventually… Rio+20 in June!!! Please send an email to newyorkplus20 (AT) gmail (DOT) com if you would like to attend on Monday night and have not yet received an invitation. Also, visit the CUCSD Facebook page to see the first photos from the event. We will be posting more info online in the coming days. Once again, a massive THANK YOU to everyone who got involved, whether as a volunteer, participant, or speaker! NY+20 seeks to educate young people about the upcoming UN Conference on Sustainable Development (also known as Rio+20) this June and issues of sustainable development and providing them with the opportunity to encourage governments to act. NY+20 will be a one-day event held during the second round of UN Informal-Informals on Friday, April 27, 2012 at the Ford Foundation from 9:00 AM – 3:30 PM. Brice Lalonde, UNCSD Rio+20 Executive Coordinator will be the keynote speaker at this event. Other speakers include Ambassador Ojiambo of Kenya. Through NY+20, we can inspire regional youth to become involved in the UN processes that impact their futures, and allow them to form their own opinions on sustainable development. NY+20’s participants will develop their own “Youth Statement” about what they would like to see happen at Rio, and then present this to the global community. We will be presenting our “Youth Statement” at a side event during the second round of UN Informal-Informals the following Monday, April 30 from 6:15-730 PM at the UN headquarters. The event that will capture diverse youth voices from NY and surrounding areas is being extended online! 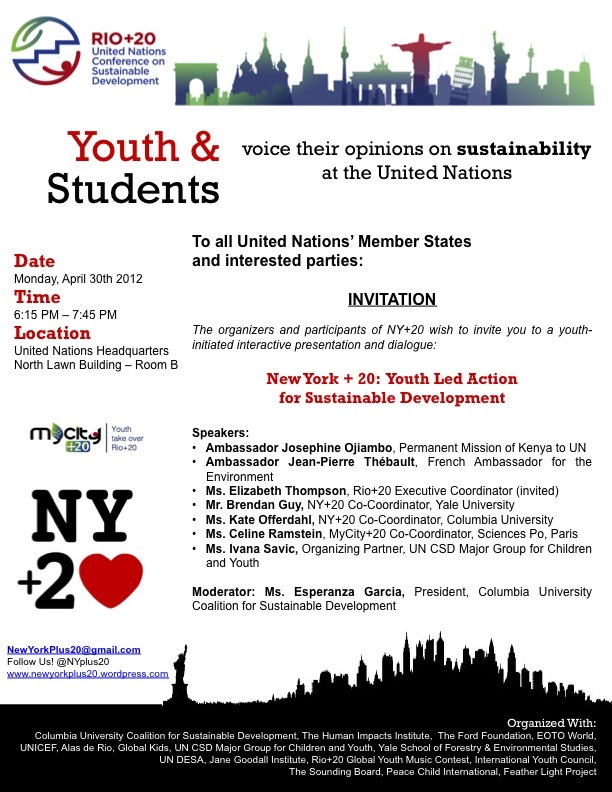 If you are interested in Sustainable Development, youth voices and/or Rio+20, NY+20 is YOUR chance to have your voice heard loud and clear around the world. Join an interactive discussion that will happen throughout the day on 27 April 2012 starting at 9am EST. Listen to the conference opening and closing streamed live and interact with live facilitators that will discuss key issues for sustainable development and Rio+20. How do you see the future of sustainable development? Tune into our live-stream and interactive conference on our website(newyorkplus20.wordpress.com/live-stream), or following the directions below! You can join in via mobile phone, computer text or video! If you plan to interact with us via video, be sure to have headphones, mic and a working camera. If you cannot participate via video, no problem! You can text your comments/questions to us and everyone can view it live. Whether you are watching online or attending the event onsite, we encourage all our participants to blog about our event. The winner of our blog contest gets their blog posted on the tcktcktck.org, UNICEF, and our other media partners website. And, if you are in New York, we can give you a ticket to attend our side-event at the UN on Monday, April 30, 2012. Win a trip to Rio! IF YOU HAD 2 MINUTES TO TELL THE WORLD ABOUT THE FUTURE YOU WANT…WHAT WOULD YOU SAY? If you’re interested in doing more, please email Manish Joshi for other opportunities. This Friday, over 100 high school and university students will gather to discuss issues of sustainability that will shape the quality of their lives for years to come. NY+20, a youth-initiated and led event, will engage and inspire youth and students from the Greater New York City area to voice their opinions on the future of their world to top academics, United States Government and United Nations representatives, and other youth leaders. We need your help to ensure that we can bring the diversity of voices that this event deserves. We are seeking a total of $500 to sponsor high school students from low-income areas around New York City to attend the event. Even $30 is enough to sponsor one student to attend the event. This event is organized for New York City youth by a coalition of dedicated students from colleges around the region, and we hope you will support us in our efforts to engage the next generation of sustainability leaders. Help propel youth to make a lasting difference in the world through this secure link: http://www.gofundme.com/newyorkplus20 . Your name will be listed in all of our materials as a NY+20 donor, and your contribution will be valued during and after our conference. We had an incredible response in terms of the number of applications to come to NY+20. Thank you to everyone who applied! You have not made it easy for us to pick our maximum number of 100 participants. We would have loved everyone to come but the room can only hold so many. We will be contacting you in the next day or two! We are excited and honored to have the UN Executive Coordinator of the UN Conference of Sustainable Development (Rio+20) as our keynote speaker. We look forward to seeing him speak at NY+20.